The question has haunted Greg Matlashewski for years. Why are these people dying when they don’t have to? 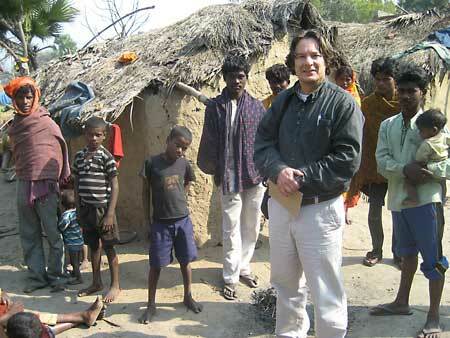 ‘These people’ are victims of visceral leishmaniasis, also known as kala azar or black fever. The disease, which is transmitted via sandfly bites, is characterized by high fever, substantial weight loss, swelling of the spleen and liver, and anemia. Because the disease severely compromises the immune system, it leaves patients with little resistance to fight off other infections. If left untreated, visceral leishmaniasis is almost always fatal. Greg Matlashewski in the village of Moriyama in India’s Bihar state this past February Matlashewski was investigating an outbreak of visceral leishmaniasis. The question has haunted Greg Matlashewski for years. Why are these people dying when they don’t have to? ‘These people’ are victims of visceral leishmaniasis, also known as kala azar or black fever. The disease, which is transmitted via sandfly bites, is characterized by high fever, substantial weight loss, swelling of the spleen and liver, and anemia. Because the disease severely compromises the immune system, it leaves patients with little resistance to fight off other infections. If left untreated, visceral leishmaniasis is almost always fatal. There are an estimated 360,000 new cases of visceral leishmaniasis each year worldwide, and over 60 per cent of these occur in the remote northern state of Bihar, India. Although Bihar is only one state, it has a population of close to 90 million and more people living in extreme poverty (below one dollar/day) than any country in Africa. In Bihar, people with visceral leishmaniasis remain in their villages for weeks or months before seeking medical care from a qualified practitioner. As a result, they can die from this disease through opportunistic co-infections, internal bleeding or severe anemia. “Although the best available treatments may be present at the primary health care centers only several kilometres away, this is of limited value if people with visceral leishmaniasis remain undiagnosed in the villages,” says Matlashewski, a former chair of the Department of Microbiology and Immunology who is now working with partners at the World Health Organization (WHO) and the Drugs for Neglected Diseases initiative (DNDi) (with support from Grand Challenge Canada and the Bill and Melinda Gates Foundation) studying ways to reach into the community to find visceral leishmaniasis cases in India, Bangladesh and Nepal. Matlashewski recently returned to McGill after taking a two-year leave of absence to work for the WHO where he led the leishmaniasis elimination program as part of the Special Programme for Research and Training in Tropical Diseases. He now continues the work he started at the WHO that includes actively finding cases in endemic villages through the use of ASHAs (accredited social health activists). ASHAs are women who live in the village, are literate and are responsible mainly for maternal and childhood health. Through a program funded by Grand Challenge Canada, Matlashewski and collaborators from the Indian Council of Medical Research are training village ASHAs to identify potential visceral leishmaniasis cases and increase community awareness through placing posters in each village. So far, over 300 village ASHAs have been trained, and with about 500 people per village this means some 150,000 people will be covered. If the program is shown to be successful, this will be scaled up throughout the state of Bihar. Work is also continuing to determine the feasibility of treating visceral leishmaniasis patients in India and Bangladesh with a single dose of liposomal amphotericin B (AmBisome) in primary health care centers that are close to the endemic villages. Treatment with AmBisome in a large hospital setting has recently been shown to provide over 96 per cent cure rates with fewer side effects than other treatments. The single intravenous treatment with AmBisome that takes about one hour will represent a tremendous advance over the current standard treatments that take over 28 days. The WHO and McGill are working with the Indian government to determine whether AmBisome can be administered at Primary Health Care Centers that are within rickshaw traveling distance from the endemic villages. Replacing a 28-day treatment with many side effects with a single one-hour treatment with no side effects and combining this with active case detection in the villages with the help of ASHAs will represent an attack on this deadly disease.